Illusion Mental starring Santiago Michel is the Spanish speaking magic show entirely en Espanol. For the first time ever, there’s an entire magic show in Spanish on The Las Vegas Strip! 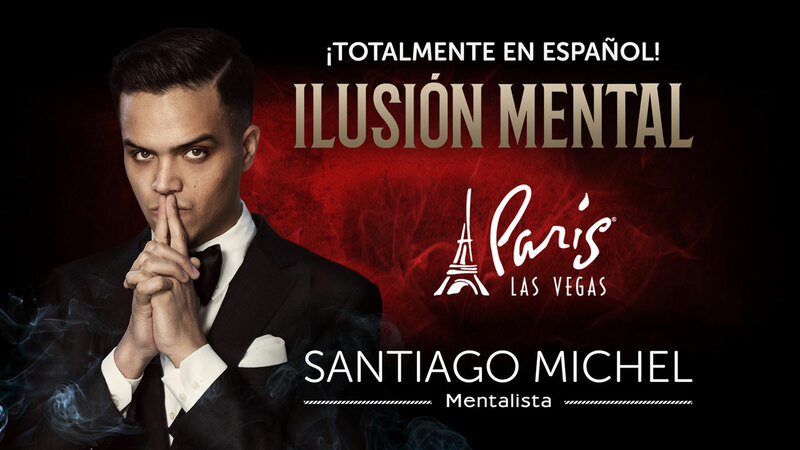 Paris Las Vegas presents Ilusión Mental featuring illusionist Santiago Michel. Presenting spellbinding tricks while spoken entirely en Español, audiences are transported to another realm of possibilities. This all-new supernatural residency has created an experience like no other that’s currently available for Spanish speaking audiences. Santiago Michel creates a universe filled with illusions that push boundaries of belief. Through knocking on doors of the mystical, you’ll enter through doorways of perception that challenge what is possible. The young magician has been traveling the globe in recent years and brings his fresh take on magic in a thoroughly modern and classy presentation. Through memorizing illusions and the most charming disposition, Santiago knows how to engage audiences of all ages with his stylish manner. Witness feats of hypnotism that will thoroughly leave you in amazement and wonder. Wish a dashing elegance, this consummate showman knows how to entertain the global audience in this completely family-friendly production. It’s great entertainment all around. Filled with suspense and humor, wit and surprises, this is like nothing else out there. Be warned though, Santiago can read minds so be careful what you’re thinking about. It’s all in good fun though as he aims to give everyone in his audience a good time and make them believe in magic like when you were a child.